Tate’s Tanks: Did they tank or triumph? 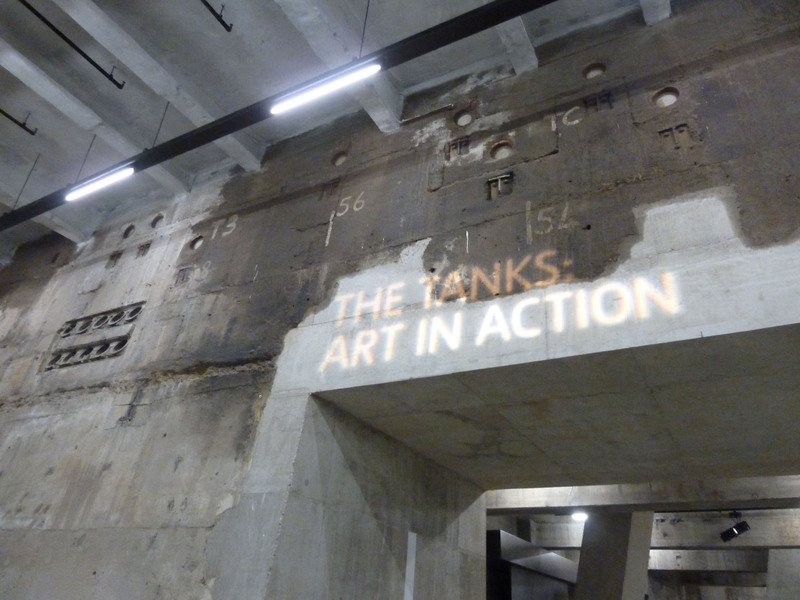 The build-up for the opening of Tate’s Tanks has been immense as this is the first major stage in the opening of the new section of Tate – The Tate Modern Project. 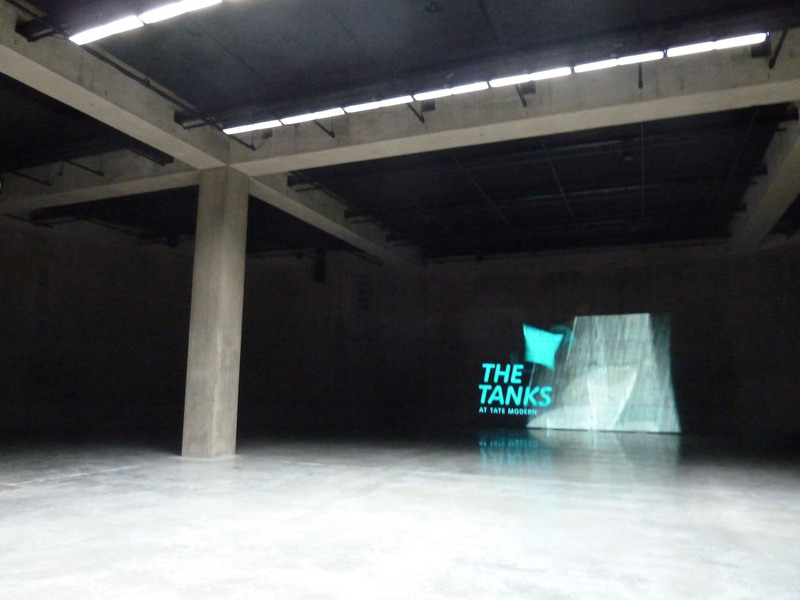 The Tanks at Tate. Own photograph. The galleries will be permanently dedicated to exhibiting live art, performance, installation and film – the first spaces in the world to have these objectives as their focus. This is a hugely important moment in the progression of the art world; one day in the not too distant future the Tanks will be part of the Survey course at the Courtauld, included in an introduction to art history and we are witnessing this at its inauguration. It is all part of the evolution of Tate Modern, as Nick Serota cornily said the Tanks are a “new instrument in the orchestra that is Tate Modern.” Tate wants the tanks to challenge the arts, they aren’t simply white cubes or black boxes, they are a new zone that falls somewhere in between. To kick-start this space Tate has launched, Art in Action, a fifteen week programme that will allow visitors to explore these art forms. Originally designed to hold one million gallons of oil, the tanks are found industrial spaces of a particular shape. I must say that I expected something more spectacular, the three interlinking spaces that attach to the Turbine Hall are beautiful but not domineering. These are not neutral spaces, there is a lot of history associated with the tanks and all artists are responding very differently. But, the reopened Tanks, for me, don’t connect strongly enough architecturally with their antecedents. The Turbine Hall has always felt as if it is the heart of the power station; the space is often compared to that of a cathedral in its proportions, the cavernous architecture lending power and majesty. We know what this was and we know what it has become. It perfectly gestures to its past while acting as one of London’s most well-known and best-loved public art spaces. The Tanks are too austere to beckon to their heritage. Whilst they use concrete and an industrial language, Herzog & de Meuron could have taken this further to better effect. However, it’s great to see the spaces of hidden London being utilised. 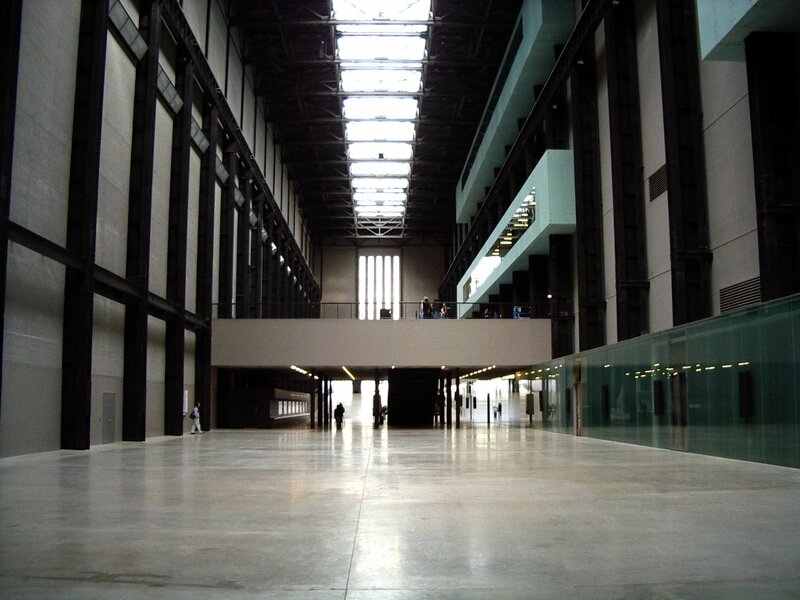 The Turbine Hall at Tate Modern. Image via www.powerinspace.org. 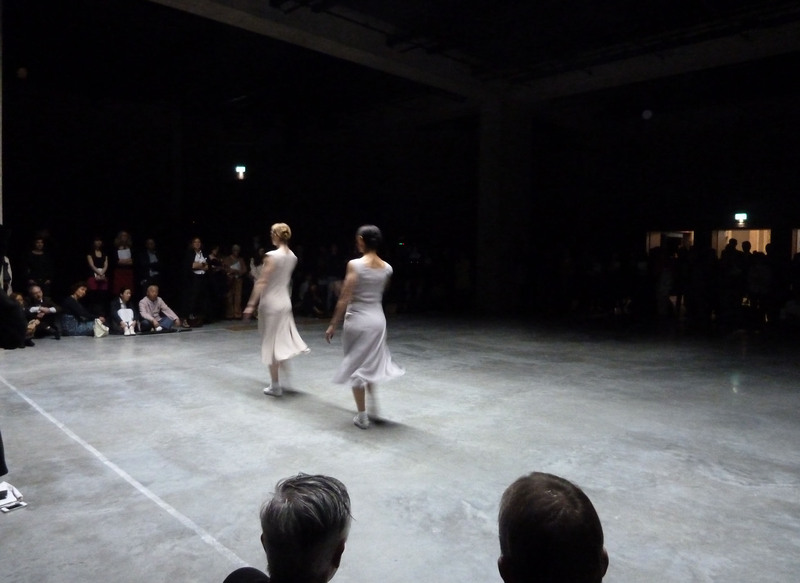 At the press preview, we were able to watch a dance performance, Fase: Four Movements to the Music of Steve Reich choreographed by Anne Teresa De Keersmaeker with Ann Veronica Janssens. The piece explores the relationship between music and dance, outlining the principles of music composition rather than just dancing to music. As they closed the doors to this tank, the space became appropriately claustrophobic for this hugely repetitive piece of structured dance. The audience watch from around the dance floor, enclosing the dancers and creating the walls of the room with their bodies. Although Fase didn’t really grab me, it is a very accomplished performance linking the genres of dance and art and Tate has produced some very interesting programme notes to accompany the whole series that are well worth a read. Fase in the Tanks. Own photograph. The next stage in expanding Tate’s orchestra (ick!) will use the foundations embedded in the Tanks to support the creation of ten new storeys that radically reinterpret the brickwork of the original power station. 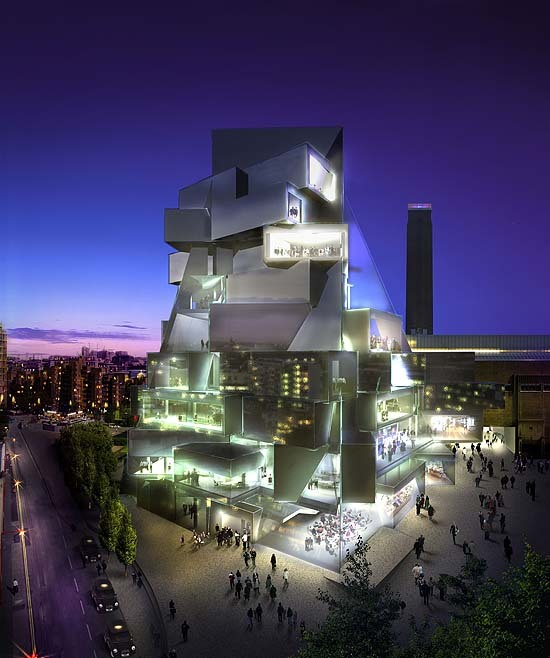 Due to the amazing pace that this project is unfolding, Tate has been fortunate enough to work again with Herzog & de Meuron for this extension. The new part of Tate will use the same language with a literal twist. 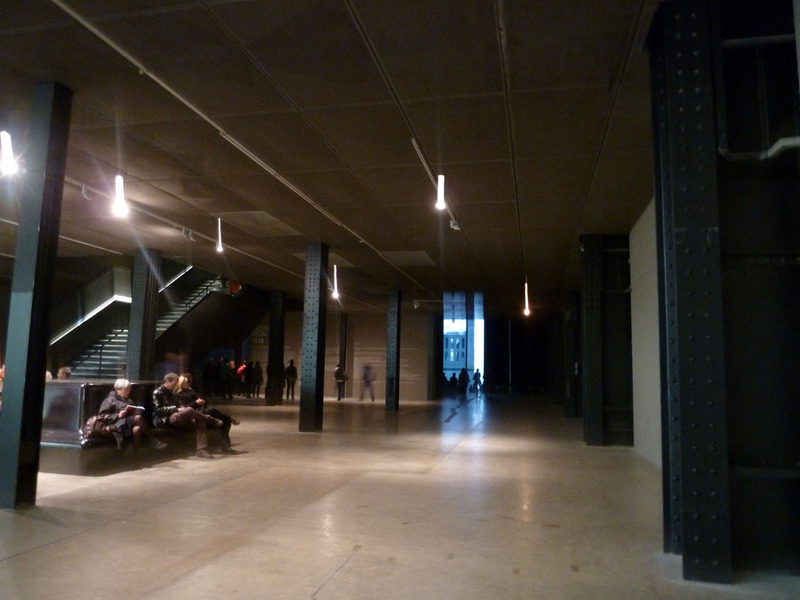 Herzog & de Meuron have ensured that the Tanks seamlessly open from the Turbine Hall (which will remain as the building’s backbone), showing that they intend to maintain the integrity of the building with a continuous flow. Due to these ambitious plans, the Tanks won’t yet remain open full time but they are giving us a taster of what is to come. By 2016 we should have access to it all. The plans for the next stage. Image via www.hughpearman.com. The Tanks are currently quite confusing. We didn’t really know what was where, the labels are outside the galleries and don’t guide people satisfactorily and generally we weren’t sure what was going on. 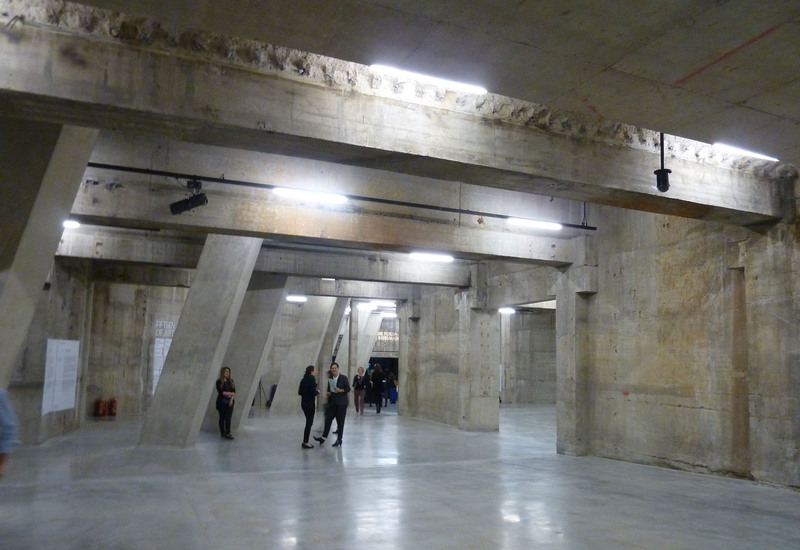 But I imagine these are all teething problems and by the end of the fifteen weeks when over 40 artists will have performed, the Tanks will be an integral part of the London art scene and we’ll be starting the countdown to the opening of the next section of Tate. Fifteen Weeks of Art in Action will be in Tate Modern’s Tanks until 28 October 2012, www.tate.org.uk. Whatever I thought of Doris Salcedo’s Shibboleth at Tate Modern, it is certainly the most enduring of the Turbine Hall installations. Enduring because traces of it remain in the Turbine Hall and one can still walk down the scar that people once hopped across or tripped into if they weren’t looking where they were walking. 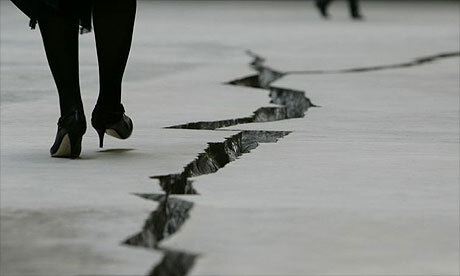 Doris Salcedo, Shibboleth. Image via www.guardian.co.uk. This is the first time since the crack that we have seen Salcedo’s work in London and, passing Mason’s Yard on the way back from a meeting, I decided to take a look. 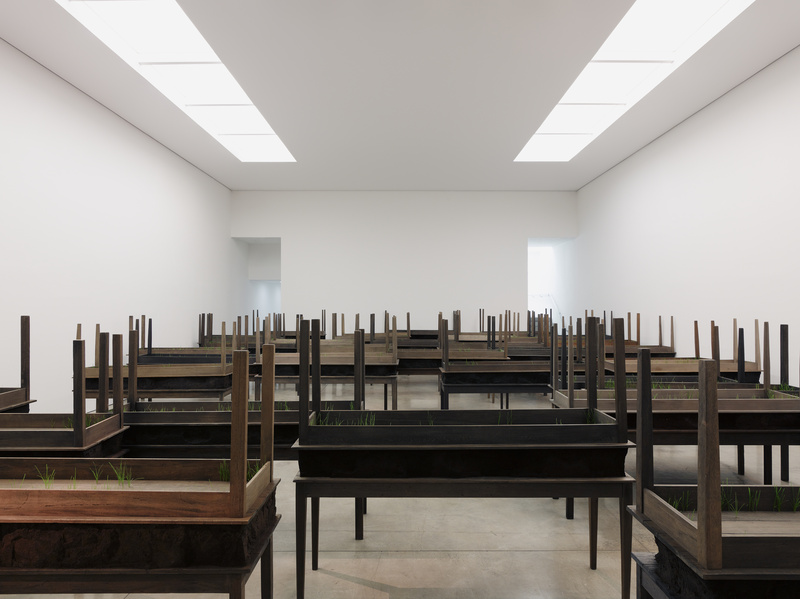 I wasn’t sure what to expect of Salcedo’s latest exhibition at White Cube and I was more than pleasantly surprised. The exhibition only includes two works – both large-scale installations – but they demand more time and respect than lots of the shows I have seen recently. Doris Salcedo, A Flor de Piel. Image courtesy of the artist via www.whitecube.com. Filling the ground floor gallery, A Flor de Piel is a huge shroud made from thousands of rose petals. From a distance the medium is indistinguishable. It was only when I read the press release that I realised what the shroud was made from. Salcedo has used the solid and substantial wilted petals that remain after the beauty and intoxicating smell of the rose’s initial bloom has faded. The work is about the simple but impossible task of presenting a floral offering to a victim of torture. It is both an offering and a symbolic representation. Like victims of torture, these petals still exist but they have changed from their initial form. 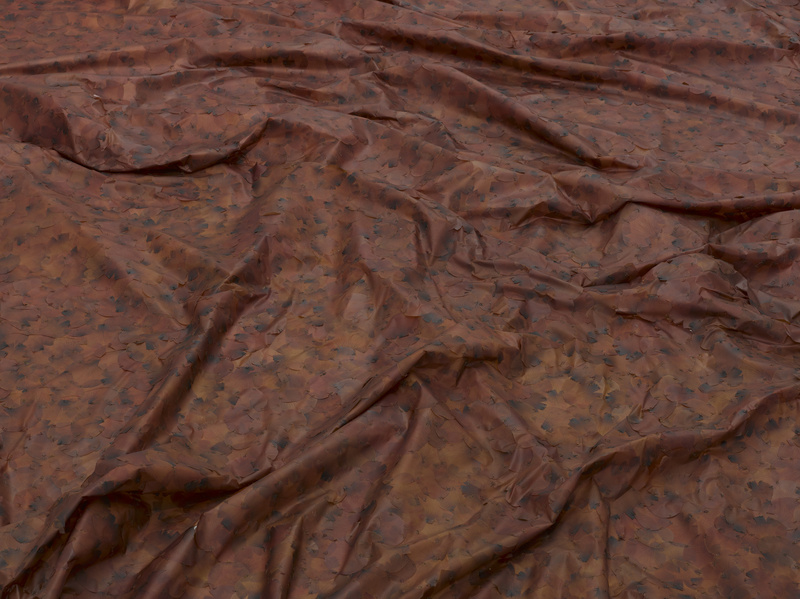 Doris Salcedo, detail of A Flor de Piel. Image courtesy of the artist via www.whitecube.com. A Flor de Piel is a work in flux that will change throughout the exhibition. By using the rose, Salcedo has tried to push the limits of fragility, amazingly sewing the petals together to resemble a fluid, skin-like surface. Downstairs, her work evokes a mass graveyard where each sculpture is the approximate size of a standard coffin, consisting of two oblong tables formed from aged wood. Yet, despite the seemingly uniform nature of the coffins, each is individual, the wood coloured and cut to be distinctive. Doris Salcedo, Plegaria Muda. Image courtesy of the artist via www.whitecube.com. The work was triggered by the murder of 1,500 men in Colombia (Salcedo is Colombian). These men were innocent, lured with the false promise of a job in the army and then taken to remote areas of the country where they were killed. The gallery is a silent memorial. Even though there were only two of us, we found ourselves speaking in whispers, showing respect to the work around us and grieving the terrible rationale for this piece. 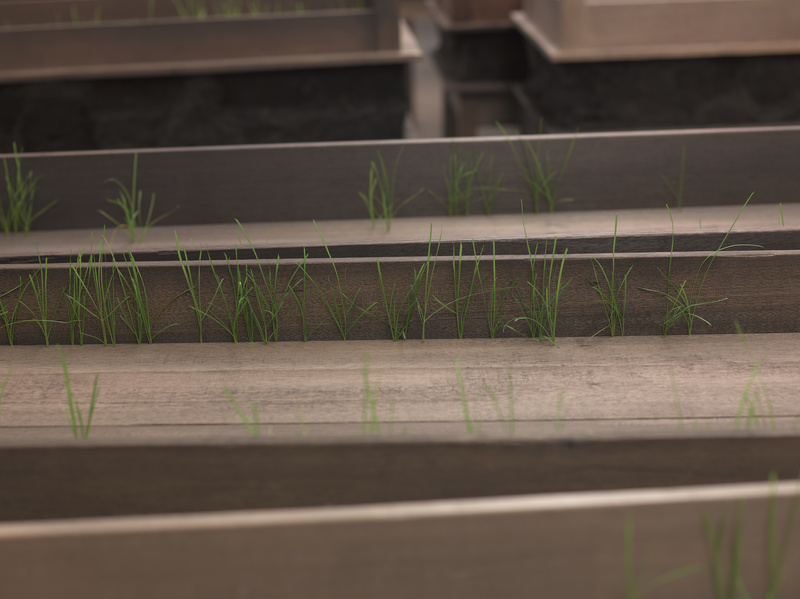 On the surface of the uppermost table, shoots of grass push their way through – a reminder of life amongst death. There is hope in these works; the grass is a poignant message that life continues against all odds. Doris Salcedo, detail of Plegaria Muda. Image courtesy of the artist via www.whitecube.com. This piece is a maze of sculptures yet this installation includes only 45 units out of the 162 that make up the full Plegaria Muda. Both works are very private, intimate portrayals of loss, grief and suffering. Salcedo’s sculptures are beautiful and graceful despite the horrors of which they speak. They are troubling but peaceful. This is a meditative show that forces us to engage with the political troubles in Colombia without being overtly-political in format. Outside, London was preparing for Jubilee weekend with excitement and celebrations everywhere. I left the gallery in a contemplative silence, really surprised by how touching and provoking these works are. Although Shibboleth may still have a physical imprint on one of London’s most famous galleries, it never really had a profound effect on me when I visited and I felt it was lost in the cavernous space. These two works at White Cube could not have been more different to that and I found the exhibition very moving. I only hope that London will see more like this from Salcedo before too long. 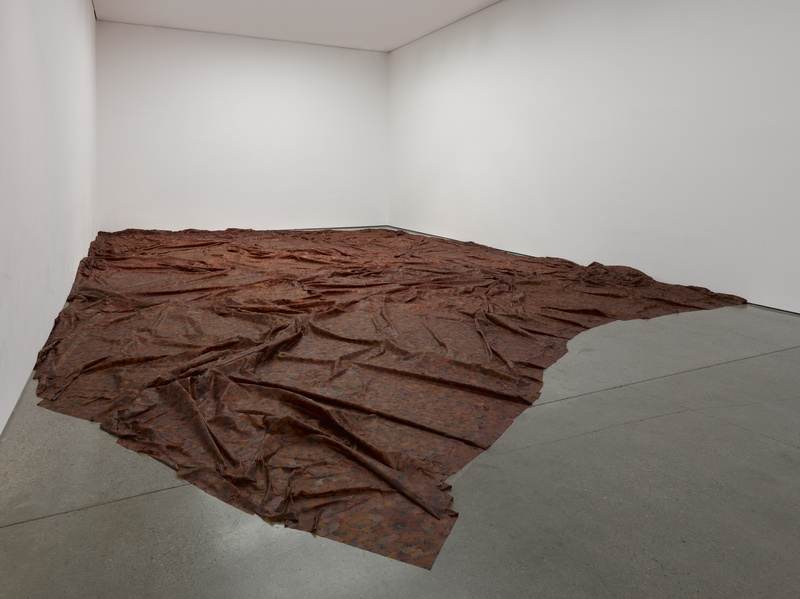 Doris Salcedo is at White Cube, Mason’s Yard, until 30th June 2012, www.whitecube.com. There is a tendency to Hirst-bash which seems more prevalent since Gagosian recently oversaturated the public consciousness, concurrently displaying Hirst’s spot paintings in all of their galleries. An alarming amount of negative press has led up to his Tate retrospective and, from conversations I overheard, people had turned up to Tate Modern on Monday morning determined to criticise. I wasn’t expecting any surprises with this exhibition as we all know Hirst’s work inside out, nor was I aiming to analyse the individual pieces; this has been done before and I know what I like and what I don’t like. I was more interested to see how these works had been collectively displayed. Damien Hirst, Spot Painting, 1986. Own photograph. The exhibition brings together works from across his entire oeuvre with over 70 pieces ranging from The Physical Impossibility of Death in the Mind of Someone Living (his large shark in formaldehyde) to his notorious diamond encrusted skull. Of course, the exhibition doesn’t seek to show everything he has ever produced and his paintings that were briefly shown (and slated) at the Wallace Collection are notably missing. Damien Hirst, detail of The Physical Impossibility of Death in the Mind of Someone Living, 1991. Own photograph. Hirst first hit the art scene in 1988 when he conceived and curated Freeze, an exhibition of his own work and that of his fellow students from Goldsmiths. Many of the works shown there are included in this exhibition for only their second public showing. 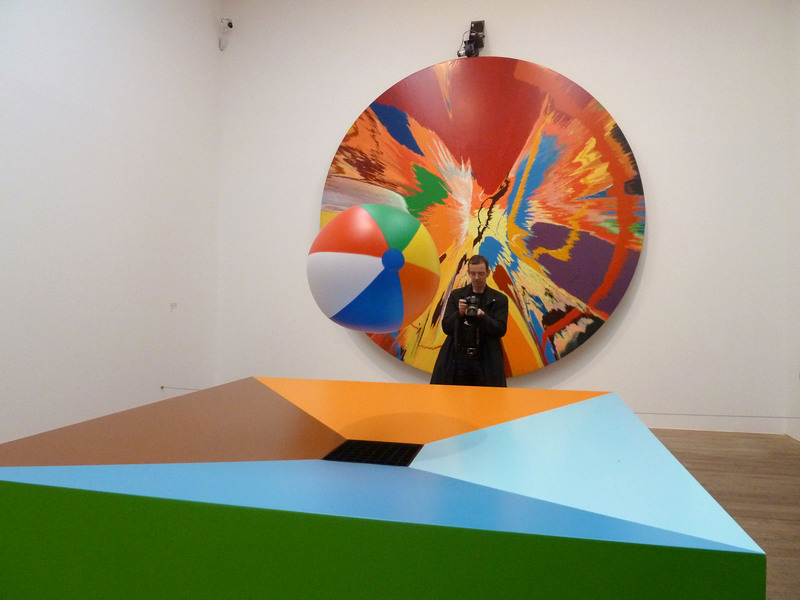 Damien Hirst with For the Love of God, 2007. Image via www.guardian.co.uk. 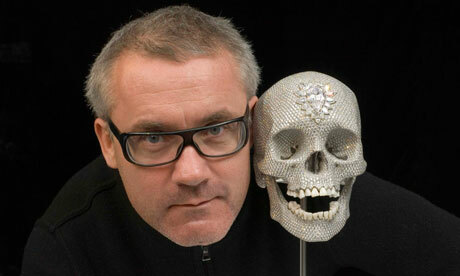 Hirst once said that ‘becoming a brand name is an important part of life’ and he has certainly achieved that. He does not deny the importance of money and the exhibition screams of blatant wealth; For the Love of God, a platinum cast of an eighteenth-century human skull encrusted with 8,601 diamonds, sold in 2007 for £50 million, has its own security guards and is displayed in isolation in the Turbine Hall. For the first 12 weeks of the exhibition, his iconic skull stands as a distinct element to the main retrospective, a free display illustrating Hirst’s ideas of mortality and value that will tempt people to head upstairs and pay admission. It’s harder to get in to see than the Crown Jewels. 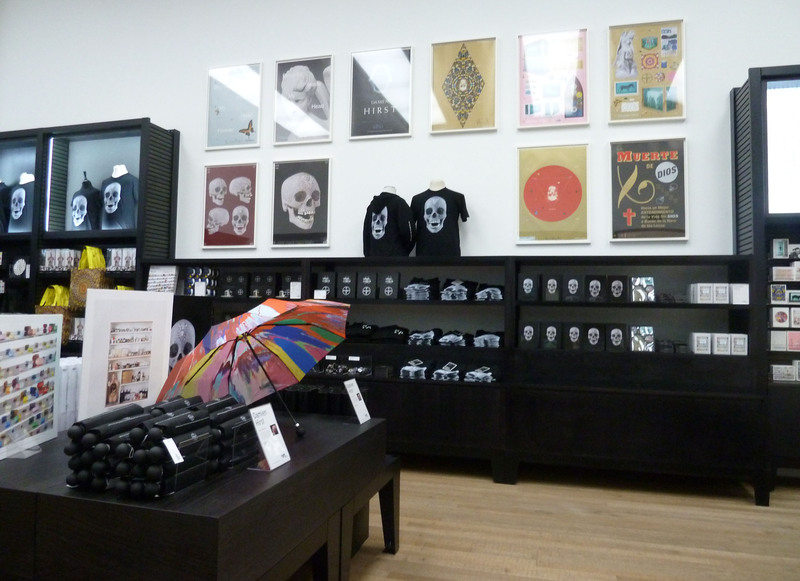 The skull’s special exhibition room. Own photograph. The wow factor and status associated by many with owning a Hirst overflows into the exhibition shop where they clearly believe people will pay £36,800 for a limited edition plastic skull! Hirst’s shop at Tate Modern. Own photograph. Hirst’s works present a study of the transience and frailty of life – areas with which he has been obsessed over the years in a repetitive process that can sometimes be tiring even for the most ardent fans. But, whatever you think of him, everyone knows Damien Hirst and he has marked our culture like no other contemporary artist. 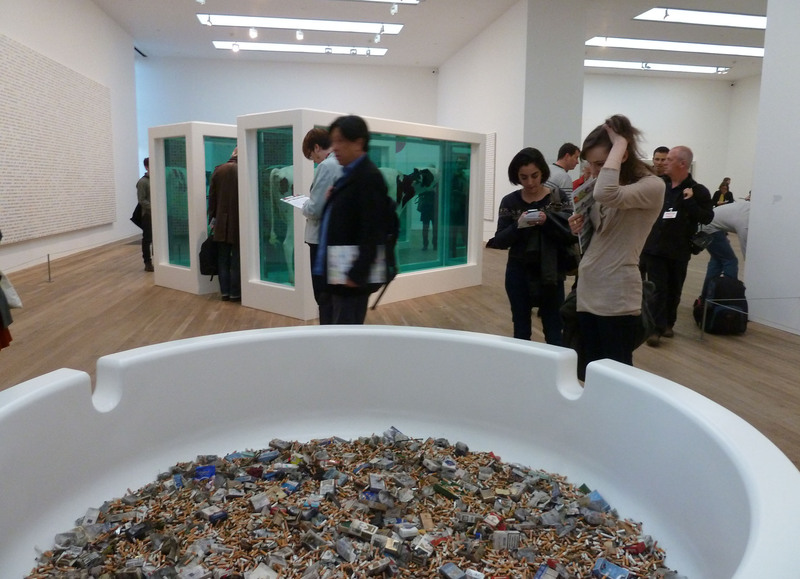 The exhibition is beautifully presented and the curators have succeeded in showing Hirst at his best. Hirst has never been one to follow conventional artistic paths; in 2008, in an unprecedented event, he sold 244 of his works through Sotheby’s rather than through a commercial gallery, engaging directly with the art market in a method that enraged many. The walls of room 13 are clad with wallpaper derived from the covers of catalogues from this sale and it is this sort of curatorial spark that excites the exhibition. 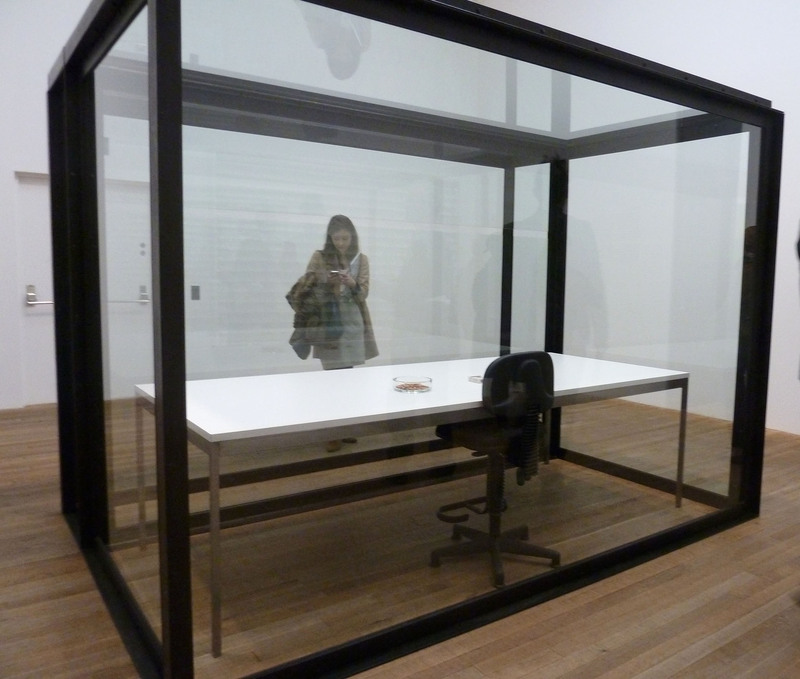 Room 13 at Tate Modern’s Damien Hirst retrospective. Own photograph. My main criticism and dislike, however, is the room of live butterflies – a recreation of In and Out of Love, his installation from 1991 that was shown at the Anthony d’Offay Gallery where one floor contained five white canvases embedded with pupae from which butterflies hatched. They then spent their lives eating, feeding and breeding. Downstairs in the gallery, dead butterflies were pressed onto brightly covered monochrome canvases. Damien Hirst, detail of In and Out of Love (White Paintings and Live Butterflies), 1991. Own photograph. 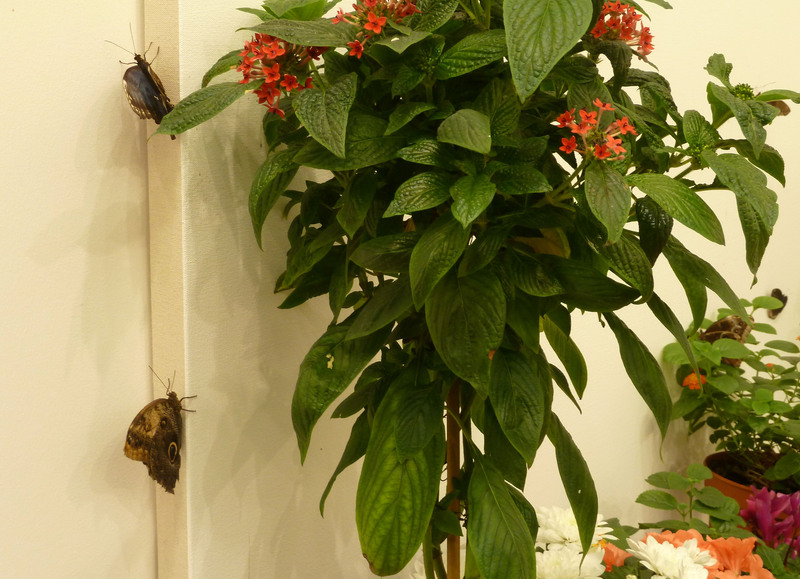 The butterfly installation can now be seen in a very humid room six which has been specially designed for this purpose. 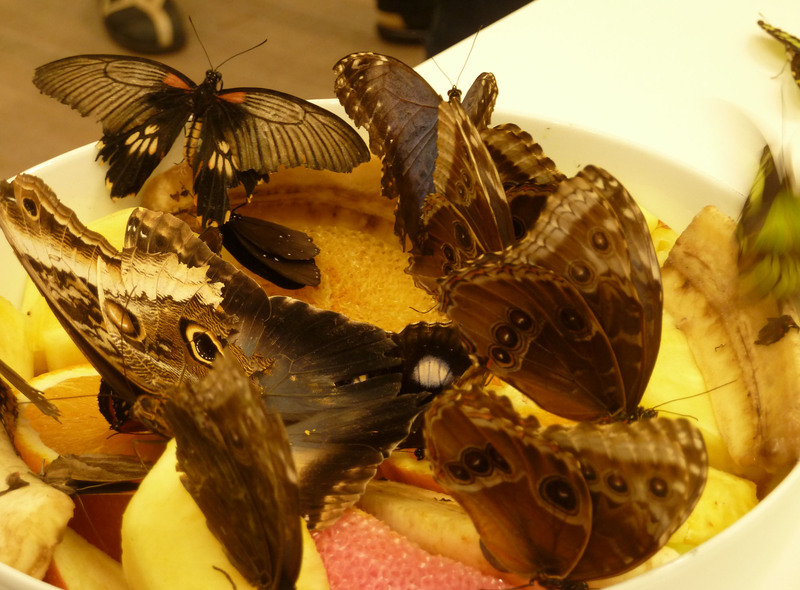 Tate are quick to point out that the butterflies are all sourced from reputable UK butterfly houses and are known to thrive in these conditions (overcrowded galleries?). They are also working with a professional consultant to check that the butterflies are comfortable. There is no doubt they are stunning specimens but I found this work horrific. Let Hirst play with dead animals but leave the live ones alone (I know I’m a hypocrite but I don’t feel as strongly when he kills flies). Although there is a strict one-way system that allows staff to check that no one leaves with butterflies clinging to their clothes, the butterflies are still escaping all the time; I saw several being returned on Monday morning, one even carried back to its habitat by Nick Serota. I wouldn’t be surprised if this room has to shut; it is in a ridiculous location, forcing people into a hot room filled with live insects who keep flying towards the plastic sheeting in a bid for freedom. 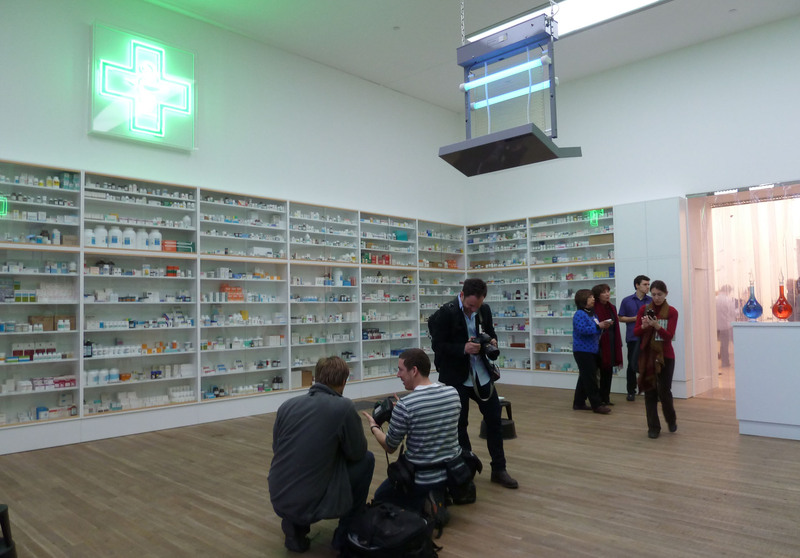 Moving on, Pharmacy takes over an entire gallery with drug-filled vitrines and colourful jars creating an ecclesiastical aura. 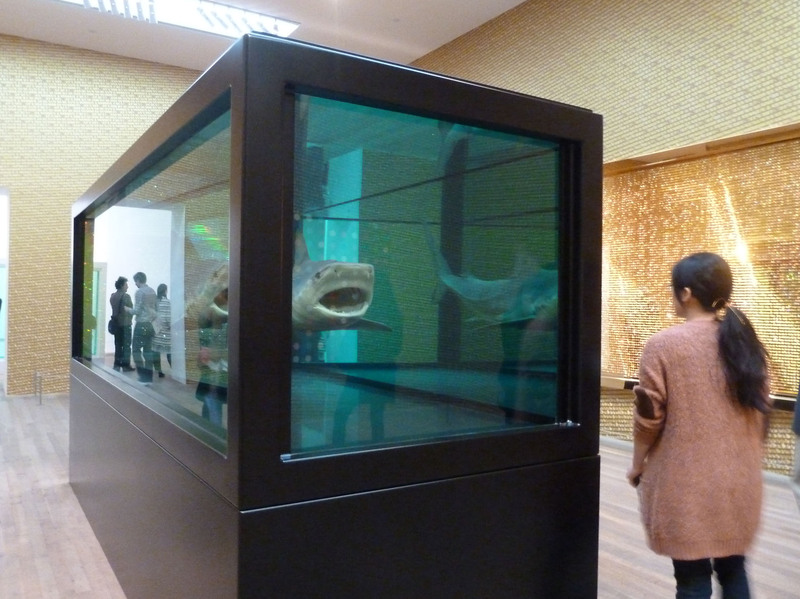 Hirst’s art continues to become bigger, bolder and brasher. Damien Hirst, Pharmacy, 1992. Own photograph. Although it is a powerful work, I’ve never been keen on A Thousand Years. When it was last shown at the RA, I found the smell quite nauseating. But even worse was Crematorium, an oversized ashtray filled with cigarette butts and ash, a contemporary memento mori – a lifetime’s accumulation of the debris of smoking that also parallels the cremated remains of the human body. Damien Hirst, Crematorium, 1996. Own photograph. A Thousand Years shows Hirst’s overt debt to Bacon and, of course, this is not the only work that alludes to his greatest influence. The Acquired Inability to Escape plays on Bacon’s methods of enclosing figures within cage-like lines. The objects suggest a human presence within the vitrine while the structure generates a sense of confinement and distances the viewer to another remove. Damien Hirst, The Acquired Inability to Escape , 1991. Own photograph. The very clever titles that Hirst uses give his work more gravitas than it would otherwise have and they do not require too much close attention so the crowds may be more bearable than at most of the other London blockbusters. Instead, this exhibition is about the concept of the retrospective and overall impression of the exhibition aesthetic as a whole. 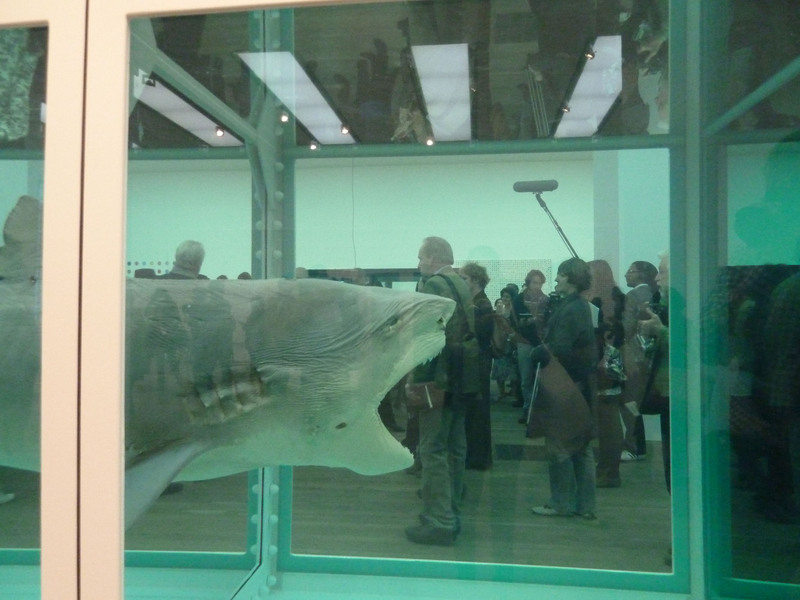 Whatever you think of Hirst, he has made his mark on art history. 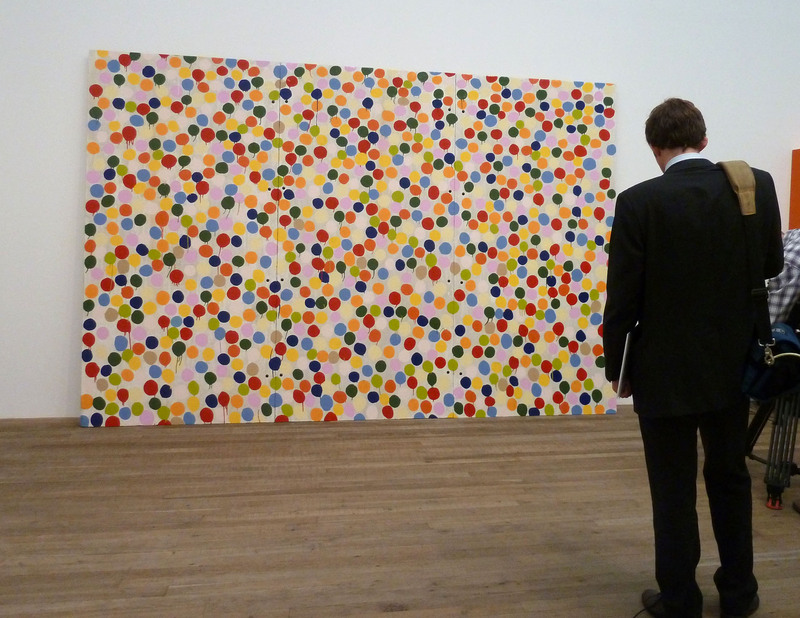 Hirst’s spin paintings at Tate Modern. Own photograph. I was surprised by how good the exhibition is; in parts, it presents Hirst as a serious artist and shows a progression in his thinking. It is generating a love/hate response but, this is what he does and really I don’t think he would want things any other way! 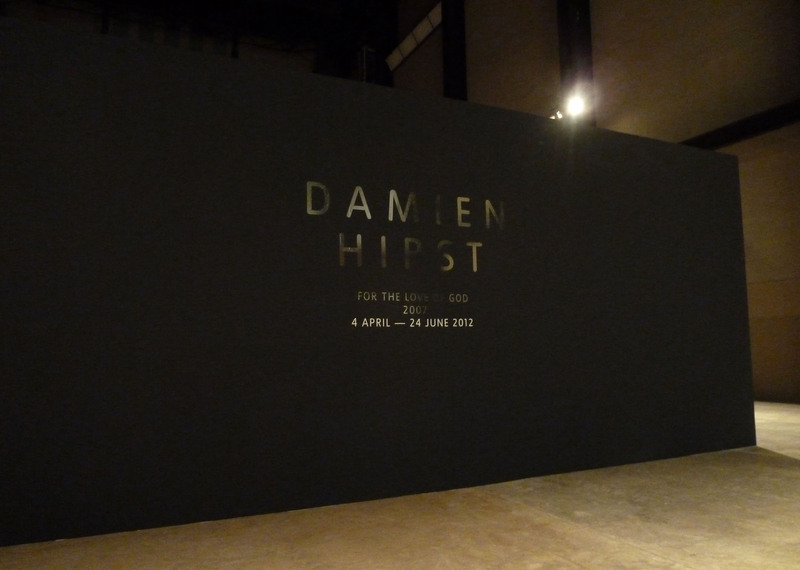 Damien Hirst is at Tate Modern until 9th September 2012 and For the Love of God can be seen in the Turbine Hall until 24th June 2012, www.tate.org.uk. Pictures of the latest Unilever installation seemed to confirm my Turbine Hall pet hate; this has long been one of my favourite spaces yet, although some of the installations have been magnificent, no one really seems to quite master the enormity of this space at Tate Modern. The Turbine Hall, which once housed the electricity generators of the old power station, is five storeys tall with 3,400 square metres of floor space. The Unilever Series has been going since 2000 when Louise Bourgeois embarked on the first commission. Since then many famous artists, including Anish Kapoor, Rachel Whiteread and, most recently, Ai Weiwei, have undertaken the project. The Turbine Hall. Image via www.tate.org.uk. It is a daunting challenge. Do you fill it all like Kapoor’s Marsyas did? Fill it vertically? Use just a bit of it? There must be a checklist –Olafur Eliasson did light, Bruce Nauman, who played with the concept of empty space, conquered sound, Carsten Hőller even turned it into a giant playground. 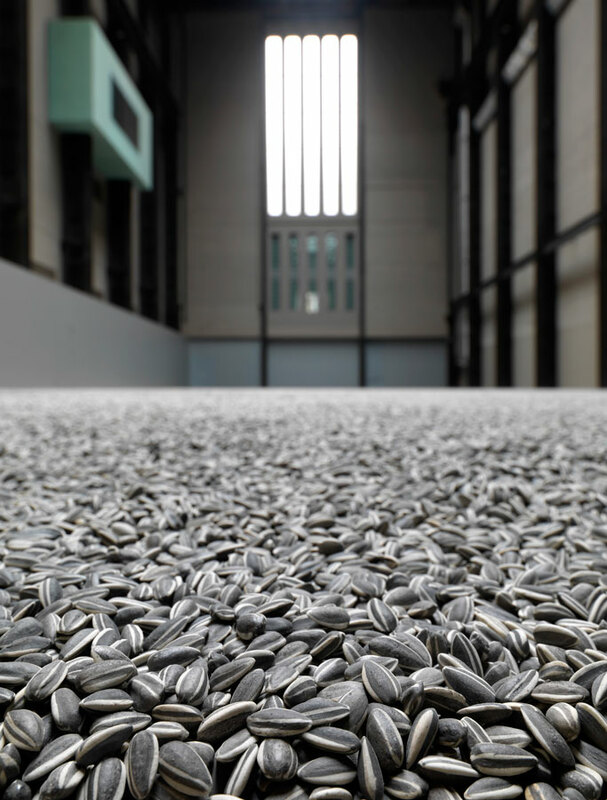 There is often controversy or debate surrounding the installations and, last year, Ai Weiwei’s sunflower seeds famously had to be portioned for health and safety reasons. 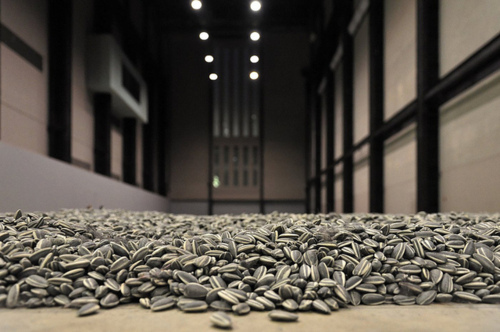 Ai Weiwei’s Sunflower Seeds. Image via http://contemporary-art-blog.tumblr.com. Tacita Dean has decided to embrace the height of the space. Her work calls to mind many forerunners who tried this too. 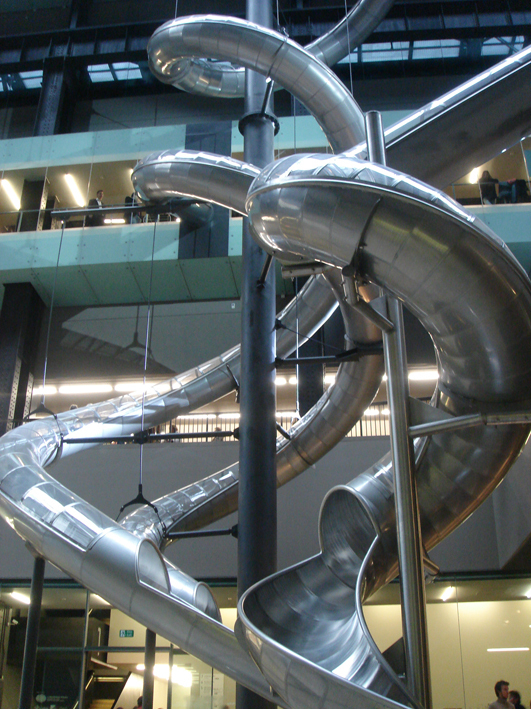 In 2006-7, Hőller’s Test Site (five spiralling steel Makrolon slides) descended from various levels of Tate Modern, culminating under the bridge of the Turbine Hall. Visitors were able to interact personally with the works that aimed to release them from everyday restraints, questioning human behaviour and offering the possibility of self-exploration in the process. Carsten Hőller’s Test Site. Own photograph. This was the first installation, until now, to take real advantage of the tremendous verticality of the hall. Test Site made viewers, or participants, look at the Turbine Hall and the slides from different perspectives and heights and to experience the sensation of descending through the hall. No other commission had attempted anything to such an extent, although the three steel towers of Louise Bourgeois’ 2000 installation, I Do, I Undo and I Redo, encouraged its audience to climb the spiral staircases that ascended around central columns supporting platforms surrounded by large circular mirrors. Louise Bourgeois’ I Do, I Undo, I Redo. Image via http://poulwebb.blogspot.com. Like Test Site, Dean’s work neglects most of the available horizontal space of the Turbine Hall. 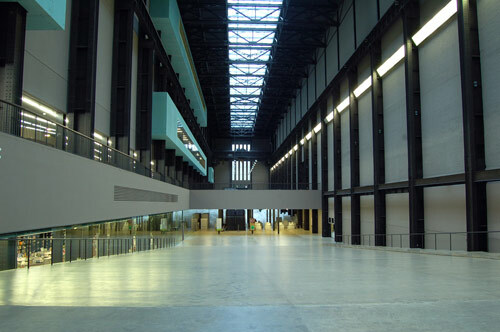 When you first enter Tate Modern, the piece is quite insignificant within the cavernous architecture and does not attract your first glance. The entry to the commission is equally underwhelming, compared to the spectacle of its predecessors. But, when you do arrive at the section given over to Dean’s work it is brilliant, atmospheric and near-perfect. The entrance to Tacita Dean’s FILM. Own photograph. FILM is an 11 minute, silent, 35mm looped film, that is projected onto an enormous monolith dwarfing all who approach the darkened end of the hall. The work upends the usual landscape format of moving image. Taking the appearance of a filmstrip with sprocket holes, exposed onto the emulsion, it pays homage to the traditional analogue process, highlighting the threat to which film is subjected nowadays and the impact its loss will have on our culture. The work often looks transparent, as if someone is hanging a film reel from the ceiling. Rather than being an actual film, FILM seems to offer a portrait of a film shown in portrait format. The work is about the importance and specificity of the medium. The film itself is a montage of imagery – a Mondrian painting, hand-tinted pictures, the mountains of René Daumal’s novel Mount Analogue, a spurting fountain, the Paramount Studio logo, a giant snail, the Turbine Hall, a giant ostrich leg, escalators, pigeons, the sea…. I don’t think the content is the key factor here. 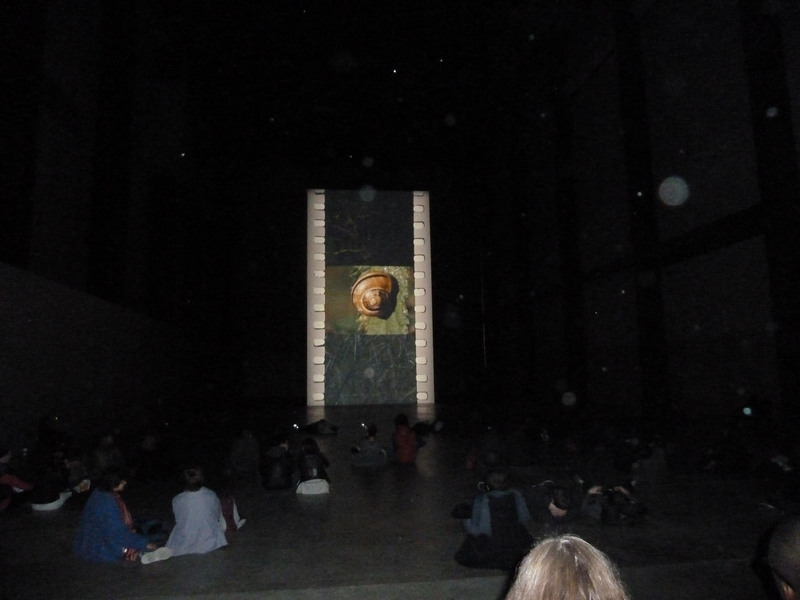 Dean has transformed this end of the Turbine Hall into a cinematic theatre where visitors sprawl across the floor, transfixed by the giant screen. Tacita Dean’s FILM. Own photograph. This response to Dean’s FILM reminds me of the climatic landscape that Eliasson’s large sun created in the Turbine Hall when a gigantic, illuminated orange disc was suspended from the ceiling at the far end of the hall. The Weather Project, was, in actual fact, an illusion; in reality, a semi-circular, fragmentary mirror was hung on the lit ceiling creating the appearance of a full circle. 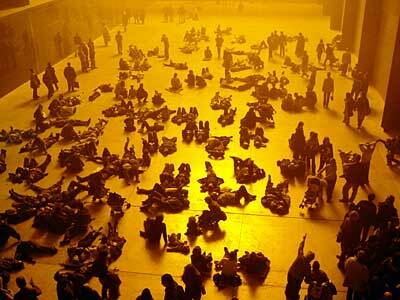 Visitors became immersed in the piece, lying on the floor of the Turbine Hall for hours in an attempt to find their own reflection in the mass of swarming shapes. The Eliasson, the Hőller and now the Dean installations have initiated cults; filling the Turbine Hall with people and turning it into a meeting place for social interaction with art, leading to various interpretations of social activism where the pieces are not only sculptures and installations but performances and encounters. Olafur Eliasson’s The Weather Project. Image via www.urban75.org.uk. I personally didn’t lie down – still exhausted from last night’s art exhibition at Chinawhite, I was worried I might have fallen asleep. The Unilever Series 2011 – Tacita Dean: FILM will be in the Turbine Hall at Tate Modern until 11th March 2012, www.tate.org.uk. 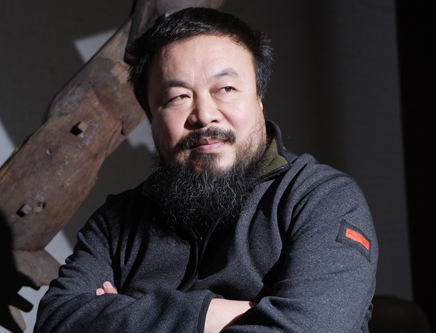 On 3rd April, as he was about to board a flight to Hong Kong, Ai Weiwei was arrested. He has not been seen since. Ai has become the most high-profile victim of Beijing’s crackdown and heavy-handed suppression of political dissidents. Where is he? Unconfirmed reports refer to his torture and the world fears the worst after the state-run newspaper wrote that he “will pay a price for his special choice”. His disappearance has certainly made us more aware of the atrocities that occur in China. Between 7 and 8 million Chinese are held in prison or camps, enduring torture or enforced labour with around 5,000 suffering the death penalty every year. More than the rest of the world combined. This behaviour is ‘impossible’ – a term Ai himself coined last year in his criticisms of China’s authoritarian government. Ai Weiwei. Image via www.frumforum.com. Recently acclaimed for his Turbine Hall installation, Ai is a polymath – an artist, architect, designer, activist and blogger. His work at Tate Modern consisted of one hundred million porcelain sunflowers seeds all made and hand-painted in China. It’s easy to read this figure and not realise the gravitas of such a number – one hundred million is five times the population of Beijing. Each seed is unique, deeply symbolic, representing food, comfort and social interaction; sunflower seeds saved many from starvation and despair during the Cultural Revolution. As in many of Ai’s works, the seeds explore ideas of mass production (we live in an era where everything bears a Made in China sticker) challenging traditional craftsmanship and the importance of individualism. Ai Weiwei, Sunflower Seeds, The Unilever Series, 2010, courtesy of Ai Weiwei. Image via www.tate.org.uk. 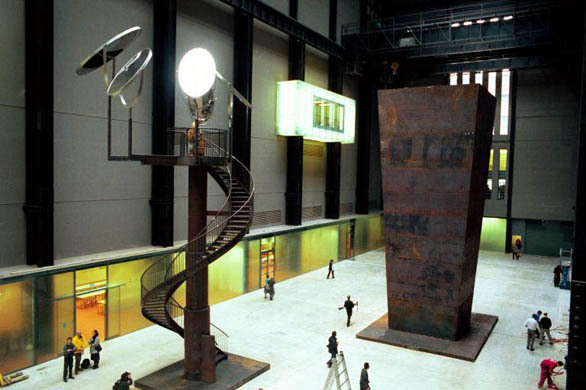 When the work was first installed in the Turbine Hall, visitors could walk, lie, sleep on and dance in the installation but, ironically, after only two days, Tate was forced to cordon off the work due to lung-damaging dust, depriving visitors of all that the seeds represented. Ai can now be compared to one of his seeds – unique as an individual who wasn’t afraid to speak his mind, he has been ‘cordoned off’ for fear of the damage he may cause. Before this work opened, the state police beat Ai for condemning the government’s reaction to the 2008 earthquake in Sichuan resulting in a life-threatening brain haemorrhage that required emergency surgery. Yet, Ai was never afraid. As a tribute, Tate plan to create a giant stack of the sunflower seeds on the 5th floor of the gallery, in the way Ai used to display them. In light of what has now become one of the Chinese regime’s most controversial arrests, the two exhibitions of Ai’s work that open in London this week are particularly provocative. 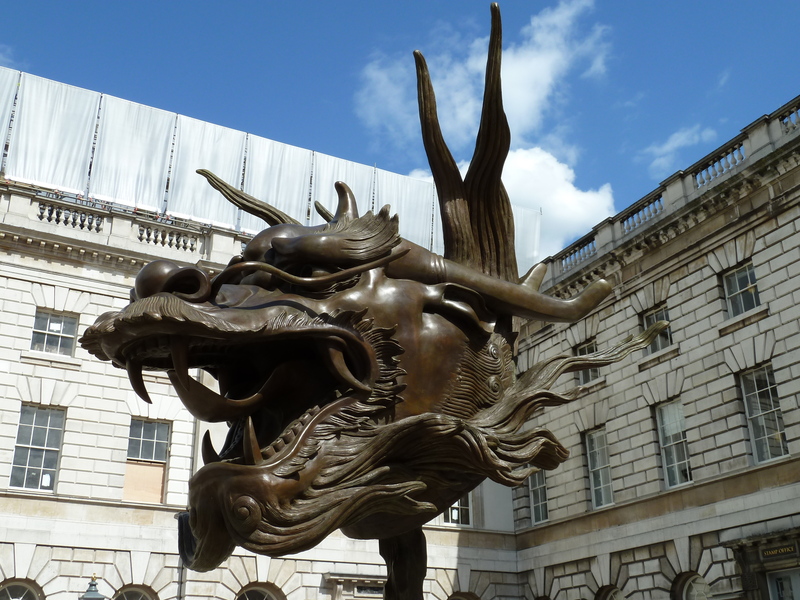 Twelve traditional Chinese animal heads stand in the courtyard at Somerset House. These oversized bronze replicas of the zodiac sculptures that once adorned the fountain clock of Yuanming Yuan, an 18th century imperial summer retreat of the Qing dynasty Emperor Qianlong, are installed in an arc around the fountains, displayed in a close recreation of how they originally stood. In my opinion, had the sculptures been placed within the fountains there would be a heightened drama but there is no denying that they look brilliant. Through the oversized scale (the head and base together are approximately 10 feet), Ai focuses on the fake and the original and on issues of looting and repatriation (only seven of the original heads have been found). These are hefty bronzes dealing with hefty issues and the works have a powerful impact. 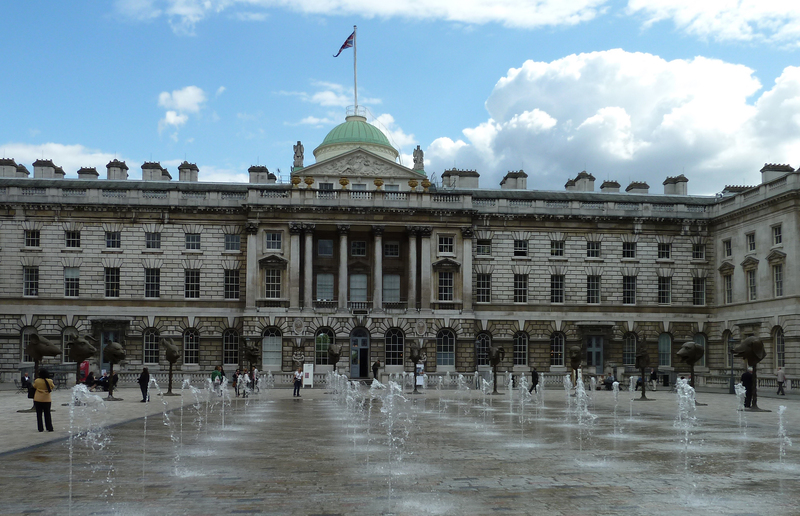 Since studying at The Courtauld Institute, I have always had a soft spot for the courtyard and, with this beacon in the teaching of art history just a stone’s throw away, the positioning of the sculptures could not be any more fitting. This is the first contemporary exhibition within the magnificent, 18th century surroundings and the sculptures rise majestically alongside the spurting fountains, tranquil despite their somewhat alarming expressions. The animals of the Chinese zodiac are thought to influence personality and destiny. 2011 is the year of the Rabbit – ambitious and confident. A cultural insider and political outsider, Ai has never been afraid to speak out against injustice; confidence and ambition is needed by us in the campaign for Ai’s release. Indeed, there has been an overwhelming response to Ai’s capture with worldwide protests, petitions, artworks, dedications (Anish Kapoor opened his Paris exhibition this week in dedication to the artist), demonstrations, and so on. The second London exhibition of sculpture and video is at the Lisson Gallery – the works fill both the echoing galleries perfectly. 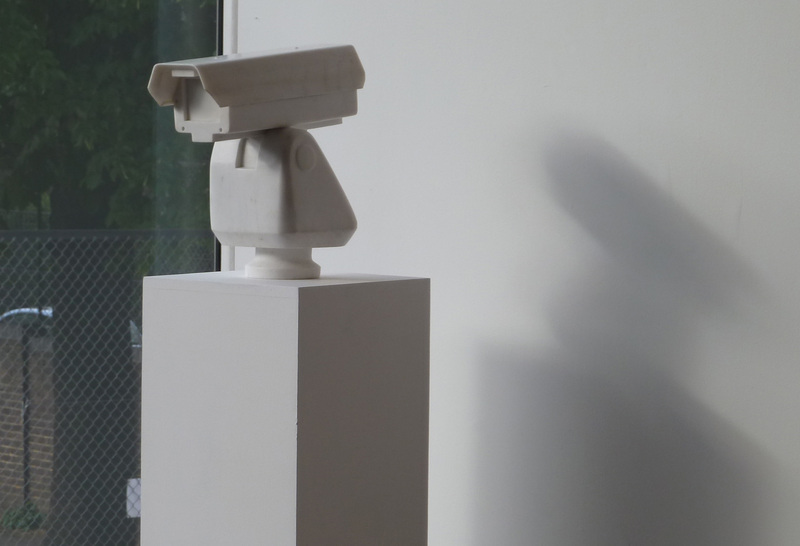 The Chinese government’s CCTV cameras have monitored Ai’s comings and goings for years and a marble sculpture of such a camera is included in the Lisson exhibition facing a real surveillance camera on the exterior of the gallery. 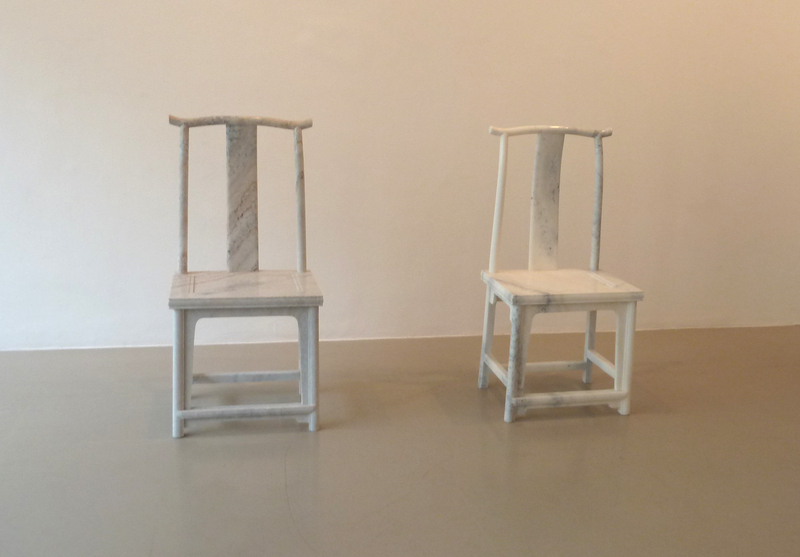 The theme of absence is omnipresent here; on entering the gallery, visitors are greeted by empty marble chairs. Ai may have foreseen his fate, the chair awaits his return, and the question of where he is now is made unavoidable. His political opinions cry out from these deceptively simple yet beautifully crafted works. Through saturating ancient Chinese vases with garish colours, he questions the opposition of commercialism to traditional values. His works are subtle in their subversiveness, full of hidden meanings. The extraordinary range of his practice blends traditions, cultures and media. 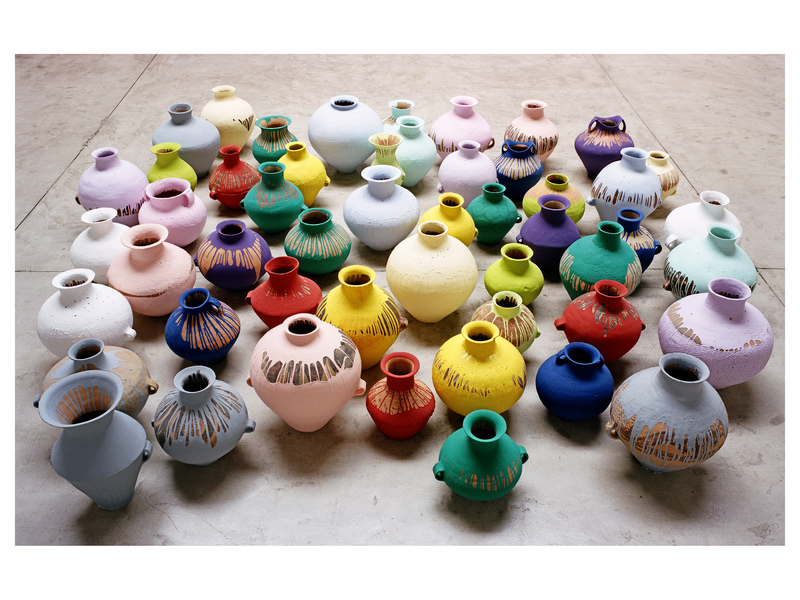 Ai Weiwei, Colored Vases, 2006, Neolithic vases (5000-3000 BC) and industrial paint, 51 pieces, dimensions variable, Courtesy the artist. Image via Lisson Gallery. At the Lisson private view, guests were given the opportunity to be photographed with a sign declaring ‘Free Ai Weiwei’, uniting us in our support. To show the art world’s solidarity and as testament to Ai’s stature all planned projects are going ahead. Ai’s detention is illegal even under Chinese law but, ironically, he is probably more dangerous now. The Chinese government have failed to be culturally aware and his arrest has shocked the world. Would these exhibitions have such poignancy if it wasn’t for Ai’s disappearance? It is hard to say but that Ai’s whereabouts are still unknown gives gravitas to his work. He is an artist of great talent but now his art stands for something far greater. 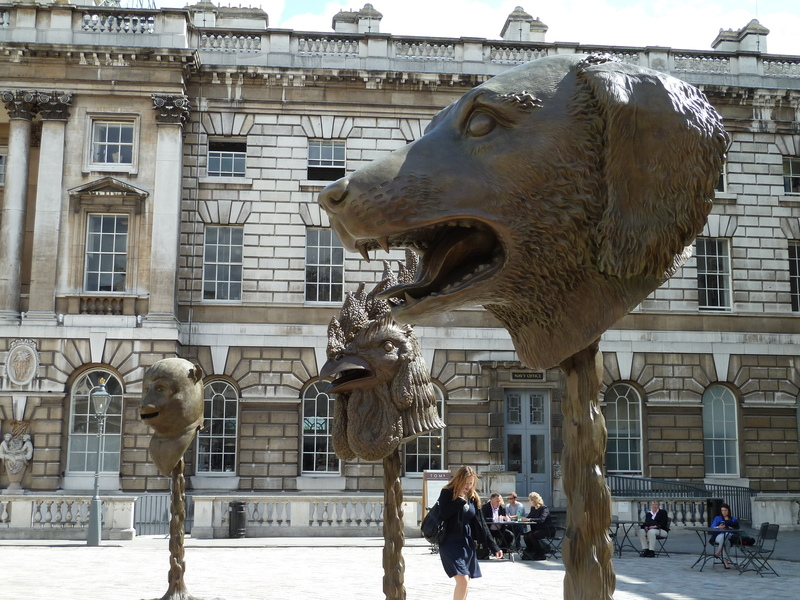 Circle of Animals/Zodiac Heads is at Somerset House until June 26th, http://www.somersethouse.org.uk/visual_arts/1326.asp. 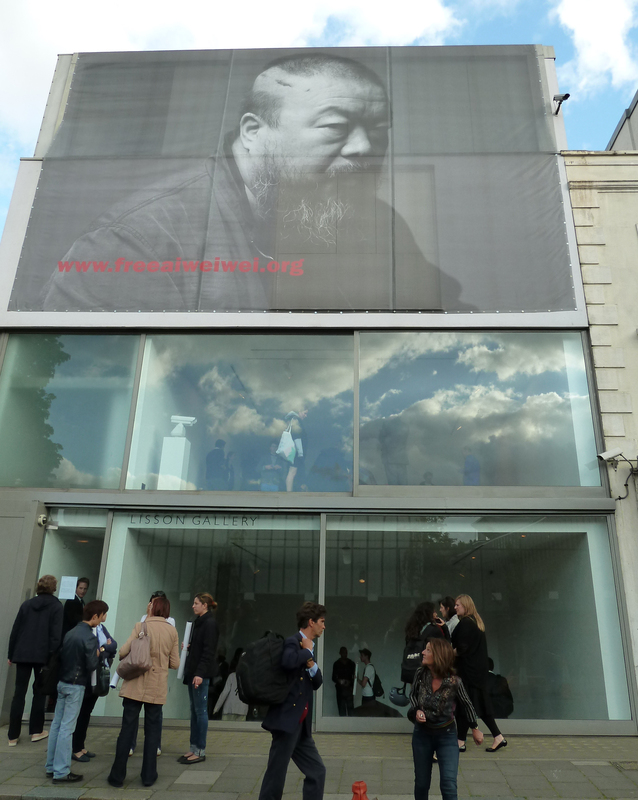 Ai Weiwei is at the Lisson Gallery until July 16th, http://www.lissongallery.com/. Sign the petition calling for the release of Ai Weiwei – http://www.change.org/petitions/call-for-the-release-of-ai-weiwei.